How fast has the climate warmed in your state? The continental United States has seen an average temperature increase of 1.3 degrees over the past century. But warming rates vary widely from region to region and state to state, according to a new report from Climate Central, a climate research group. 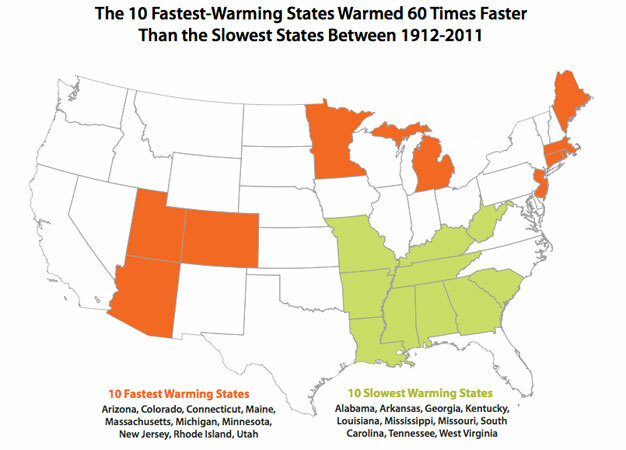 The 10 fastest-warming states are getting hotter 60 times faster than the 10 slowest-warming states—and Rhode Island is warming the fastest of all. That’s right: our smallest state has had the fastest increase in average temperatures. Although some states had a decrease in temperatures between 1912 to 2011, temperatures in all states have risen since 1970. And, as the report’s authors explain, “no matter how much or how little a given state warmed over that 100-year period, the pace of warming in all regions accelerated dramatically starting in the 1970s.” That timing coincides “with the time when the effect of greenhouse gases began to overwhelm the other natural and human influences on climate at the global and continental scales,” the authors noted. Scientists believe natural climate variability and atmospheric aerosols, which block incoming solar radiation, played a role in the different paces of change.